— Jeremy Owen, Project Manager RK Mechanical, Inc.
Denver International Airport (DIA) is undergoing a multi-year construction program to add a large- scale hotel and transit center complex next to the airport’s south terminal. The project includes a 519-room hotel and conference center, a public transit center, which will include a commuter rail station connecting the airport with downtown Denver, and a public plaza, Denver’s newest venue for programs and events. Denver-based contractor RK Mechanical is fabricating and installing the ductwork and mechanical systems for the complex. To better serve its customer, RK Mechanical uses integrated detailing, fabrication, and installation solutions from Autodesk that improve their business and project outcomes – a win-win for the company and their clients. 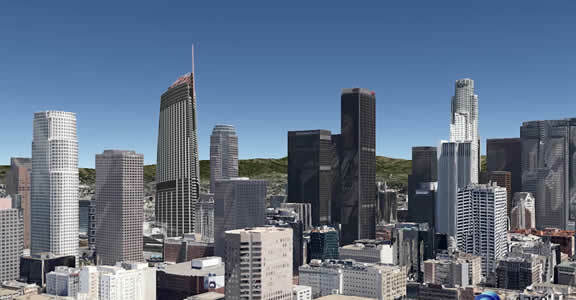 In addition to these spatial constraints, the building shape itself poses problems. The architect likens the hotel’s form to a bird with its wings extended. “A conventional hotel or office building has stacked floors, where the layout of each floor and its building systems match the floor below it,” explains Owen. But due to the hotel’s iconic building shape, every level is different and there are many spaces and rooms without floors below them—complicating the location and fit of the building systems. 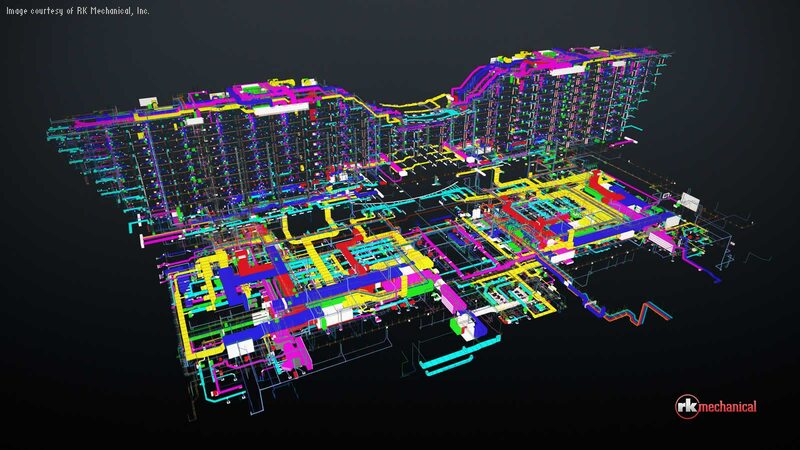 RK Mechanical is using integrated Autodesk Fabrication software and its 3D modeling environment to digitally layout its building systems and coordinate the design with architectural and structural models of the complex’s multi-discipline project elements. Building Information Modeling (BIM) workflows combined with the software’s libraries of real-world, manufacturer-specific content help the firm develop extremely accurate models with a level of detail necessary for precise coordination and fabrication. RK Mechanical uses Fabrication CADmepTM software to create 3D models of project’s building systems for coordination and detailing. When the layout and detailing is complete, the firm then uses these models for more efficient production of spool sheets and drawings to support the prefabrication of piping/ plumbing systems. For ductwork, RK Mechanical uses the Fabrication CADmep software fabrication-ready models in Fabrication CAMductTM software to drive ductwork manufacturing. The project has more than 31 miles of piping and plumbing and 70,000 joints or welds. 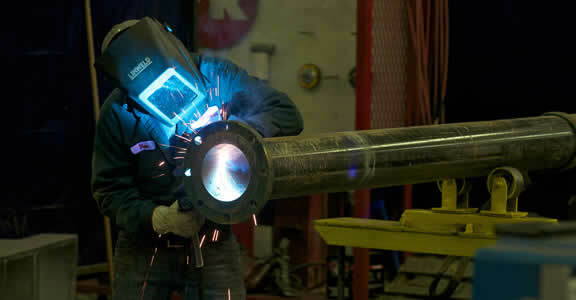 RK Mechanical’s advanced fabrication shop capabilities helps them meet these needs. To guide their routing of the building systems, the team imports 3D and 2D information from other disciplines and companies involved in the airport project, from electrical systems and ceiling assemblies to baggage handling systems and structural elements. Moreover, since Fabrication CADmep uses real-world content that contains the level of detail necessary for fabrication, RK Mechanical uses the software and its fabrication models to investigate the constructability of the building systems. Fabrication CADmep is also helping RK Mechanical coordinate all of its systems around the extension of the airport’s underground subway that will connect the new transit station. RK Mechanical also uses Fabrication RemoteEntry at the airport jobsite to expedite field changes. “To keep ahead of schedule, we sometimes prefabricate ductwork before final submittal,” says RK Mechanical CAD manager, Scott Pittman. “In these situations, we purposely skip connecting fittings, such as an attachment to a piece of equipment. 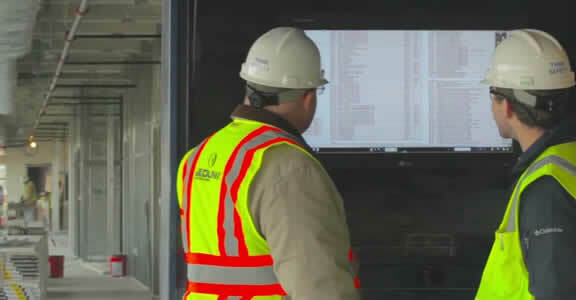 Once the equipment is installed, we use field dimensions for that final connection.” In the past, the field personnel would write the dimensions on a special form or ticket. When the shop received the ticket, they had to decipher the person’s handwriting and then manually input the information into the CAM software. If they misread the numbers or entered them incorrectly, the field would be waiting several weeks for a fitting that is the wrong size. 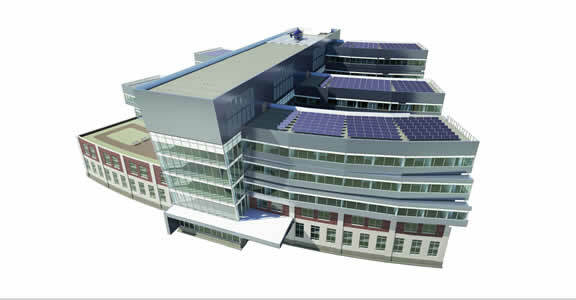 Using BIM, the company's designs are more accurate, efficient and innovative, helping to make the University of Massachusetts's utility plant more efficient. From initial estimate to building handover, BIM can help mechanical contractors reduce risk in many areas. 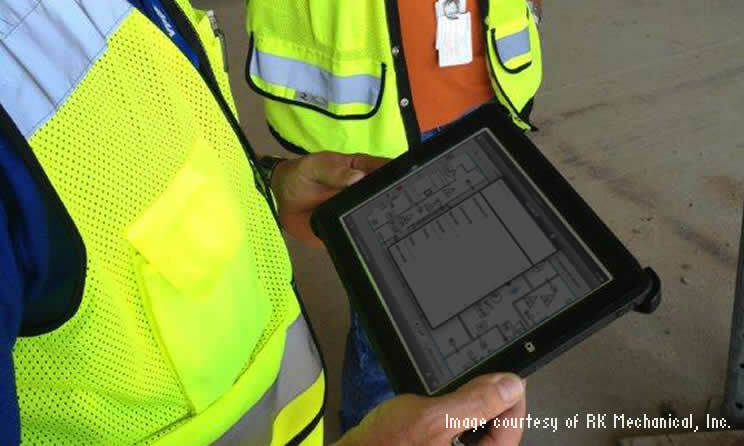 Learning BIM can be manageable for firms of any size or industry. The firm makes productivity and project quality improvements to add value to the client.